The Real Estate and Housing Developers' Association Malaysia (Rehda) is lobbying for a RM10 billion annual allocation from the government to help upgrade existing buildings to be energy efficient. The association wants this to be in the 2013 Budget. Rehda president Datuk Seri Michael Yam said the fund would cover up to 30 per cent of the costs to make the buildings green. With this in mind, the association is also asking the government to recognise other international green certifications like Singapore's Green Mark, Australia's Green Star, UK's BREEAM and the United States' LEED. This was to enable those buildings already certified with those certifications to qualify for incentives provided by the government, Yam said. Among other incentives that Rehda is seeking are stamp duty waiver for transfer of green certified properties from developers to buyers for the next five years, and double tax deduction on training expenses incurred by property development firms. Yam said this yesterday at the launch of "Green Tour KL 2", a showcase of prestigious green rated developments in the Klang Valley. Green Tour KL 2 is organised by Rehda Youth. 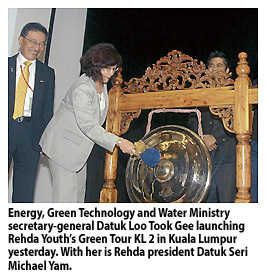 It was officiated by Datuk Loo Took Gee, the secretary-general for the Energy, Green Technology and Water Ministry. Yam said the building sector, at present, contributed about 40 per cent of the global greenhouse gas emissions but added that it could be reduced as green buildings had lower carbon emissions. Currently, less than 0.5 per cent of all commercial and residential buildings in Kuala Lumpur were green certified, Yam said. During Green Tour KL 2, projects showcased were the new Rehda headquarters in Kelana Jaya; KEN Rimba, Legian Residences, a project by KEN Holdings Bhd in Shah Alam; 11 Mont Kiara by Sunrise Bhd, a unit of UEM Land Holdings Bhd; Sime Darby Idea House in Shah Alam; and S11 House here. EKOVEST Bhd and Malaysian Resources Corp Bhd (MRCB), project delivery partners acting on behalf of the government, plan to call for some RM4 billion worth of tenders by as early as next year to help clean and beautify the Klang and Gombak rivers. The work is part of the River of Life project. Minister of Federal Territories and Urban Wellbeing Datuk Raja Nong Chik Raja Zainal Abidin said the cleaning tenders will be out first. 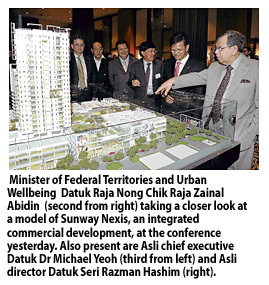 "We have set aside a total of RM3 billion for cleaning and RM1 billion for beautifying. We expect the rivers to be cleaned and certified as Class B (where it is safe to touch) within the next five years," Raja Nong Chik told reporters after launching the Asian Strategy and Leadership Institute (Asli)'s Second National Conference on Greater Kuala Lumpur/ Klang Valley - Towards a World Class Sustainable City here yesterday. He said at present the river was "toxic". "Both rivers are at Class 3 or 4, which is very bad," he added. On Invest KL, Raja Nong Chik said so far two companies from the US and Europe have put in strong interest to invest in Malaysia. "Last year, we had six; this year so far there are two companies from the US and Europe. I was in Europe in March and received a lot of enquires from companies there interested in the services sector, manufacturing and oil and gas here," he said, without elaborating on the companies. Meanwhile, Asli chief executive Datuk Dr Michael Yeoh said the conference brought together key experts in city planning and development, policy formulators and decision makers, entrepreneurs and investors, foreign multinational corporations, universities, think tanks and civil society organisations to discuss how the Greater KL/Klang Valley National Key Economic Area will benefit the stakeholders and the business community. Attractive: The number of Asian buyers of the best quality newly-built London homes jumped to 37% in 20 10 from 4% in 2009. The majority usually buy off-plan before the home is built. LONDON: When Hong Kong businessman He paid a £35,000 (US$56,000) deposit on a four-bedroom apartment in Britain, he believed it was a 40-minute walk from central London, his lawyer said. In fact it was a 40-minute journey by high-speed train. The £350,000 home was in Lincolnshire, eastern England. He sued the developer for misrepresentation last year, getting his money back before the case got to court in what his lawyer told Reuters was an attempt by the developer to avoid its marketing material being splashed around a courtroom. “It is a matter of developers saying: Here are some people who are likely to be interested. They probably do not know too much about the market, so why don't we advertise there',” said David Eldon, former chairman of HSBC's Asia unit who has witnessed the practice during two decades in Hong Kong. “I think they are being a little economical with the truth,” he said, adding that properties could be sold for higher prices in the Far East. 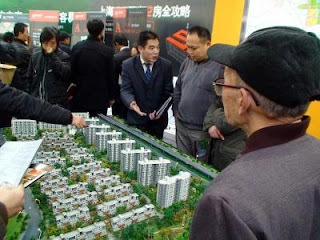 The number of Chinese and Pacific Asian buyers of the best quality newly-built London homes jumped to 37% in 2010 from 4% in 2009, data from property consultancy Savills showed. The majority purchase for investment and are used to buying off-plan before the home is built. He was told his flat was 40 minutes from central London at a face-to-face meeting with the developer, said David Linklater, head of litigation at law firm Alan Broadhurst, who represented He. Broadhurst declined to give his client's full name or the developer's identity. “Lots of people go to the fairs in Hong Kong and get a sheet of paper with a picture of Big Ben. You think you are going to be the Queen's neighbour when actually the Queen has a great big garden with a big wall around it,” said Linklater, who deals with 20-30 unhappy overseas buyers a year. “There is a lot of embellishment going on working off the naivety of the Chinese buyer,” said James Moss, managing director of property consultancy Curzon Investment Property. A brochure advertising 375 Kensington High Street, a luxury London scheme marketed in the Far East and developed by a Berkeley joint venture alludes to the proximity of the High Street Kensington underground station in a brochure entitled “London's most sought after new address”. The station, which is at the heart of one of London's most popular shopping districts, is a 15-20-minute walk away while the flats are at the scruffier end of the same long street and closer to two other tube stations. In a press release issued in Hong Kong on Friday, the development was described as “a short walk from the luxury shopping available at Harrods.” The world-famous store is a 50-minute walk according to the Transport for London website. “To an unsuspecting buyer, you think wow, it is amazing, but actually it is the wrong end of Kensington High Street, right next to Kensington Olympia,” said Camilla Dell, managing partner at Black Brick Property Solutions, which helps overseas buyers find London homes. “We have had a lot of customers from Asia over the last 20 years, many of whom are repeat purchasers,” he said.